To achieve the Sustainable Development Goals, all parties must work together and implement coherent and evidence-based policies that address health, well-being and their determinants throughout the life course and across all sectors of government and society. 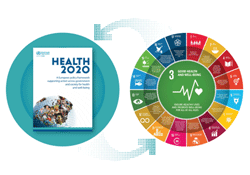 In consultation with Member States and with input from experts, WHO/Europe developed a roadmap to implement the 2030 Agenda that builds on Health 2020, the European policy framework for health and well-being. The roadmap anticipated WHO’s Thirteenth General Programme of Work, 2019−2023 (GPW 13). Efforts to implement the 2030 Agenda, Health 2020, the SDG roadmap and the GPW 13 are aligned and mutually reinforcing. Member States adopted the roadmap in 2017. It recognizes the specificity of the WHO European Region as well as the diversity and unique circumstances of European Member States as they work to implement a joint global agenda. It supports them in strengthening their capacities to achieve better, more equitable and sustainable health and well-being for the European population. The roadmap proposes 5 interdependent strategic directions and 4 enabling measures to advance the implementation of the 2030 Agenda and Health 2020.